Regional news – Thank you Janet Gray! 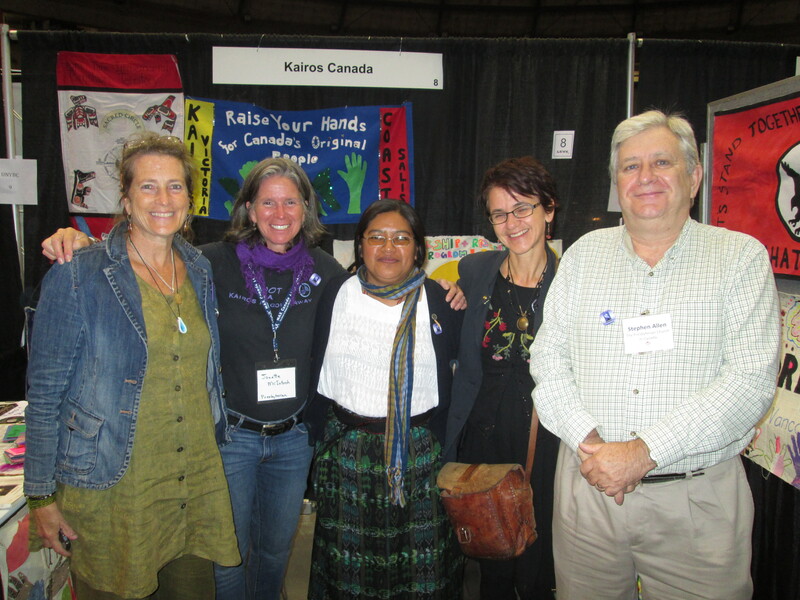 Janet Gray and Janette McIntosh (KAIROS BC-YK), Naty Atz Sunuc, Rachel Warden and Presbyterian Board member Stephen Allen at the KAIROS education display. As a community we offer a huge ‘Thank you’ to Janet Gray for 6 years of dedicated and creative service in the role of KAIROS British Columbia Yukon Regional Representative. There are many, many volunteers across the country who give voice and hands to the KAIROS mandate of faithful action for justice and peace. The role of Regional Rep is particularly important as both the leader of a regional volunteers and as the “face” of the organization on the ground in the region. Janet has served in this role since 2012. Under her leadership, relationships with Indigenous communities and civil society partners flourished as was widely evident in the 94 Calls to Justice event held in honour of the first anniversary of the Truth and Reconciliation Commission Calls to Action. Janet’s leadership has not only served the region, but she also contributed significantly to KAIROS national programs, and given dynamic leadership at national events, such as the annual governance Circle Gathering. Janette McIntosh has taken on the role of British Columbia Yukon Regional Representative. Janette is no stranger to KAIROS. She has been a local group leader in Vancouver, extending her outreach and coordination to the lower mainland. Janette is a KAIROS Blanket Exercise facilitator and has shown leadership in the organization of many exercises. Janette also represented the Presbyterian Church on the KAIROS Sustainability Circle for a number of years. Among many contributions to that work, one notable piece was her input to the visioning and implementation of the Fracking Forum held simultaneously on two ends of the country in 2015. Janet and Janette have worked closely together over the years and we are grateful that Janet will continue to be involved. These two and another past regional representative, Susan Draper, are the core of the planning team for the BC-Yukon KAIROS Network Gathering, No Passengers on Spaceship Earth: Stories of Resistance, Courage and Faith, April 26-27 in Vancouver. We also recognize Janet for her founding of the innovative and highly effective Rolling Justice Bus that brought regional engagement in a brand-new way to the KAIROS movement. The Rolling Justice Bus has spun off into its own entity while maintaining many KAIROS ties. Watch for another adventure this summer. Join us in expressing your personal thanks to Janet by leaving comments on this Facebook post.